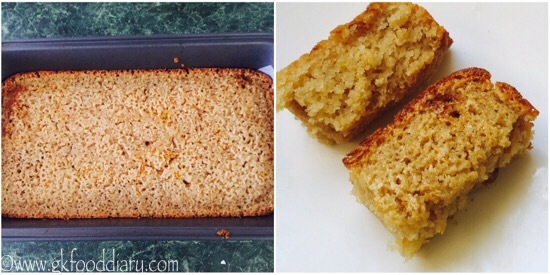 Easy Sooji Cake/ Rava Cake Recipe for Toddlers and kids – no fuss, egg-less, quick to make, fool proof, healthy cake recipe made with sooji/rava/cream of wheat/semolina, brown sugar or jaggery and nuts! 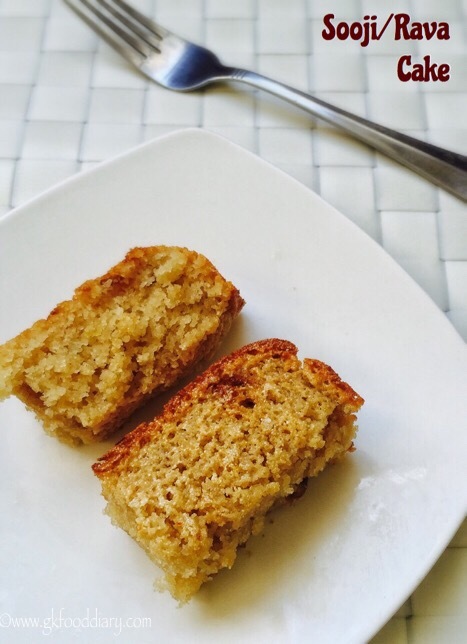 This rava cake is one of the easiest cake, even a beginner in baking can give a try! It needs only simple ingredients that are easily available at your pantry. I have already posted a version of sooji cake with mangoes, but I found the method of this one is different and tried last week. 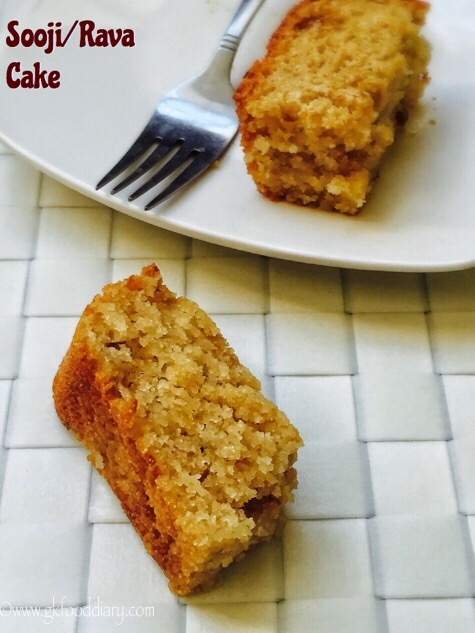 It turned out great and tasted delicious too that kids will surely love it 🙂 This sooji cake/rava cake cake can be given to toddlers after one year as a snack. Now Let’s get on to check how to make this easy egg-less sooji cake. 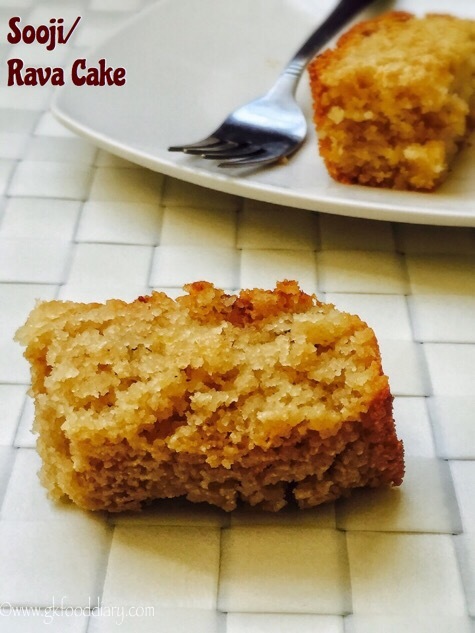 Eggless Sooji Cake/ Rava cake - no fuss, egg-less cake recipe with sooji/rava, brown sugar and nuts. Measure and keep all ingredients ready. 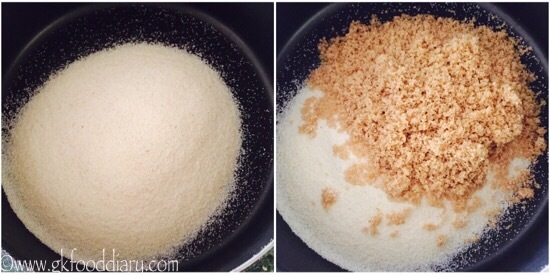 Take sooji/rava in a mixing bowl and add brown sugar/powdered jaggery. Then add curd/yogurt. Stir it well with a hand whisk until everything gets mixed well. Now add butter/ghee and stir well. Set this mixture aside for 10 minutes. In the meantime, preheat the oven to 180 degrees Celsius for 10 minutes. After 10 minutes, add vanilla essence and baking soda. Then add broken nuts and cardamom powder. Mix well. Grease the cake pan with 1 tsp of ghee and place the parchment paper. Transfer the cake mix to the prepared cake pan and gently tap it. Top it with saffron. Bake in the preheated oven for 25-30 minutes (baking time depends on the size of the pan and oven) at 180° Celsius till tooth pick inserted in the center comes out clean. Allow to cool it completely before cutting into pieces. 1. Measure and keep all ingredients ready. Take sooji/rava in a cup. Chop the nuts and keep it ready. 2. 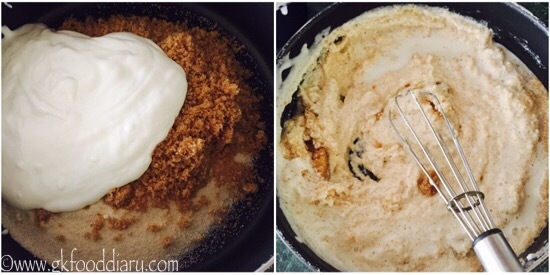 Transfer the sooji/rava in a mixing bowl and add brown sugar/powdered jaggery. 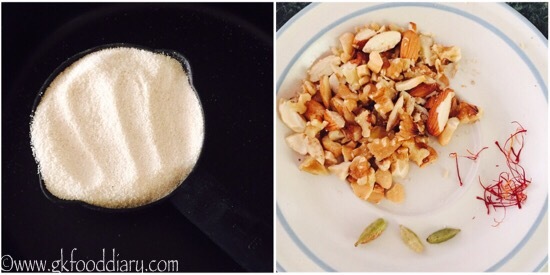 If using jaggery, powder it well. 3. Then add curd/yogurt. Stir it well with a hand whisk until everything gets mixed well. You can add few tbsp of milk if the mixture is too thick. 4. Now add butter/ghee and stir well. 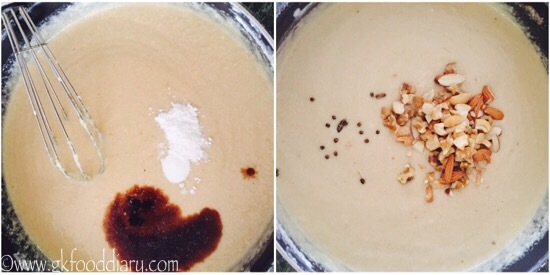 Set this mixture aside for 10 minutes until the batter consistency is reached. In the meantime, preheat the oven to 180 degrees Celsius for 10 minutes. 5. After 10 minutes, add vanilla essence and baking soda. Then add broken nuts and cardamom powder. Mix well. 6. Grease the cake pan with 1 tsp of ghee and place the parchment paper. 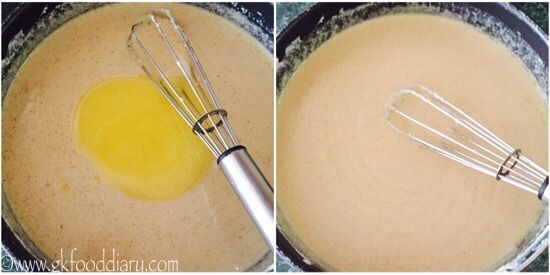 Transfer the cake mix to the prepared cake pan and gently tap it. Top it with saffron. 7. Bake in the preheated oven for 25-30 minutes (baking time depends on the size of the pan and oven) at 180° Celsius till tooth pick inserted in the center comes out clean. Allow to cool it completely before inverting the cake and cut into pieces. 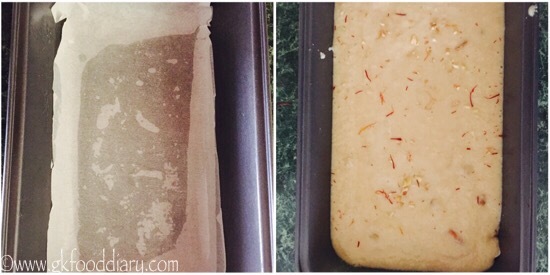 The easy and tasty sooji cake/ rava cake is ready to serve ! 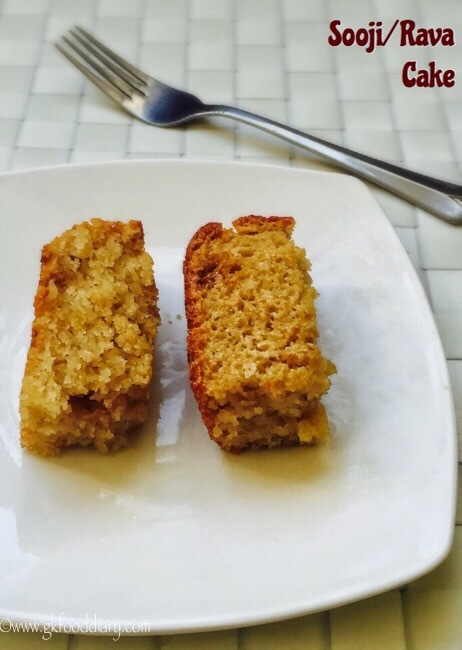 You can plus or minus the sugar/jaggery depends on your taste buds. 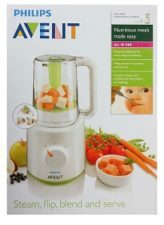 You can replace 1 cup of curd with 1/2 cup of milk and 1/2 cup of curd. This sooji cake stays well for 2 days at room temperature and keeps good for 4 days if stored in refrigerator. You could use walnuts, almonds, cashews&raisins and any nuts of your choice or even chocolate chips.